Origami is the Japanese art of paper folding. Created piece are often made from a single sheet of paper that has been folded without any cutting involved. More involved pieces may be assembled from more than one piece. A related art form, kirigami, involves both folded and cut paper. I have always been fascinated by origami--it amazes me the multitude of things that can be created from folding a single piece of paper. It was not until another psychotherapist gave a training at my clinic, however, that I even thought about incorporating it in to therapy. Art therapy often encourages art methods that allow for individual, creative expression. In contrast, origami involves carefully following a set pattern in order to create the chosen object. 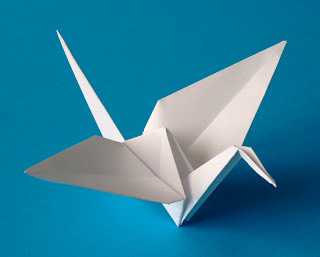 I have found, however, that the process of creating a piece of origami can be very beneficial in therapy. 3. Practicing positive self-statements: I often help kids to notice their self-talk as they approach a difficult project or point out negative comments they make. We can then talk about how these thoughts may be unhelpful and how they can practice more positive statements--replacing "I can't" with "I can do this." 4. Building self-esteem: Some children who come to therapy have very few experiences with being successful. Not only are they having behavior problems and constantly getting in trouble, but they may also be struggling in school. Many children have also developed the belief that they are not "good" at art, even at a young age. I have had more than one client who did not feel like they were good at anything, but they were extremely good at origami, sometimes even teaching me on a difficult pattern. Although I usually keep a client's art in the office, at least until the end of therapy, I do let them take home their origami pieces. It is amazing to see the look of pride on their face as they show off their origami to parents and siblings in the waiting room. I would love to hear how others might have used origami or additional benefits they have found. My experience has mostly been in working with children and adolescents, so I would love to hear from anyone who has used origami in therapy with adults. For more information, check out the links below.